Valuable lessons learned at the multi-agency emergency exercise staged at Archerfield Airport recently should lead to improved communications and response co-ordination in the event of an aircraft crash. 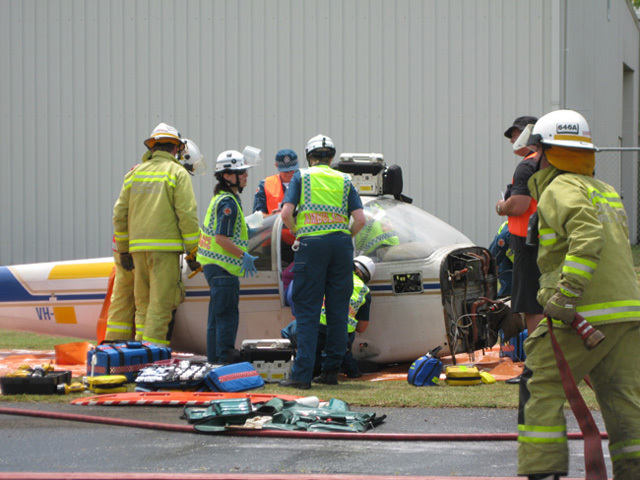 Airport, Queensland Police, Ambulance, Fire and Rescue and other response personnel were involved in the simulated crash on Friday 25 November. In the scenario, a light plane crashed on take-off, breaking into two parts and damaging a hangar. Wreckage from a vehicle and aircraft were used to create the crash scene, together with a smoke generator. ‘Casualties’ were aboard the aircraft and in the building.